This new Kindle. It’s half the price it was a month ago and going by the specs, it’s way better. What can we say except that we’re seriously considering it. I only wish the exchange rate with the dollar were better so it dipped below £100. The two American versions are priced at $189 (with wifi+mobile internet on 3g) and $139 (just wifi) with the British ones coming in at £149 and £109. The price drop significantly differentiates it from the iPad, which obviously has more functions but is several price brackets ahead at £429 for the cheapest model. However it’s likely that the new cheap Kindle will hit smaller-name brands hardest, particularly where their main advantage was the price. It’s now £10 cheaper than the Barnes&Noble Nook for example. There’s now a web-browsing kit onboard too which will let you look at websites on the easy read screen, read articles for example. Actually I’ve been using the browser on my Kindle 2 since I got it in February. Is it fabulous? No. Is it great in a pinch if my GPS is acting up and I need directions? Yes. I’ve used it to look up movie times, restaurant reviews, phone numbers, book reviews, etc. The only advantage I see to the new Kindle is that you can use WiFi (I would still want 3G as well, I download books on the go more often than I thought I would). 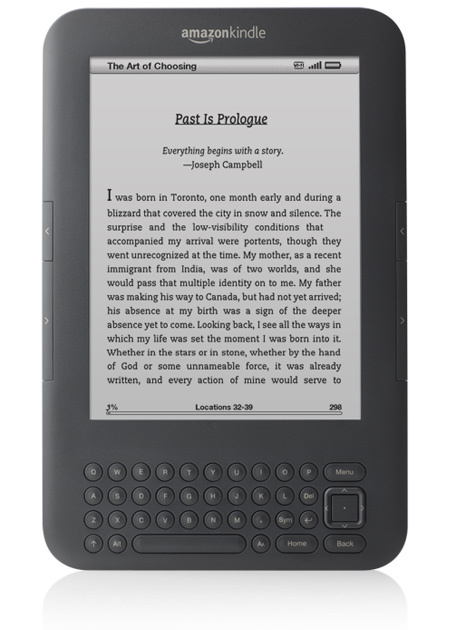 As for the size and weight – no big deal (and not much of a difference either) – the Kindle is already very light and much more comfortable to hold than a paperback book. It’s very readable and the battery life is fantastic. I am a very avid read – I go through at least 5 books a week and I share my Kindle with my 6 yr old, even with that usage I still get well over 11 days without charging (a week if I have the WiFi on a lot). The Kindle is one of the best purchases I’ve ever made (and I don’t regret spending $260 on mine). I never thought I would give up paper books, but now I can’t imagine ever going back!